Why Invest in Contractor Vehicle Wraps in Phoenix AZ? Vehicle wraps for contractors in Phoenix are more than just a good marketing idea. They are a necessity. If you do not believe us, consider that there are about 1,676 general contractors listed in Phoenix alone. This does not include the professionals who are headquartered outside of the city limits but who nevertheless do business here. Can you afford to go up against this type of competition without every edge possible? Of course, there are plenty of other reasons why adding car wraps to your fleet vehicles is a good idea. The friendly folks at Spotlight Signs and Imaging Solutions have compiled a list of the most important benefits this ad tool offers to contractors in all niches. One-time expense. If you advertise locally in the paper, you have to keep renewing the contract and write a check each time that a new ad runs. With a wrapped car, you only incur the expense one time. 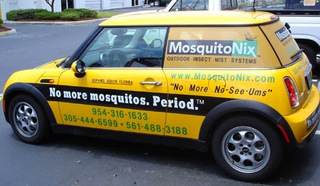 Since the vehicle will sport your marketing message for about five years, that is a great deal! High return on investment. Who actually sees your ad in the paper? Some folks buy the Sunday paper only for the coupons and do not even bother leafing through it. Others may let the paper go unread for weeks – at which point your special offer is long expired. Ad-bearing fleet vehicles get between 30,000 and 70,000 consumers to look at them each day. This is a return on investment that is tough to imitate with any other marketing medium. Memorable appearance supports branding. How can you stand out in a sea of plain white contractor vans? Having a memorable appearance certainly helps. Surveys show that about 95 percent of people remember a van with graphics, which goes a long way to ensure brand awareness. If the vast majority of folks who see your van also remember your logo and business name, how can you go wrong? Finding just the right combination of graphics and lettering for your business is a bit of an art. Our clients appreciate that we consistently find ways of combining art with cold, hard advertising science and marketing psychology. Contractor vehicle wraps for Phoenix area contractors may use local scenery, native flora and fauna, niche-specific imagery and your already designed logos and symbols. We have the expertise to display all chosen images on your fleet vehicles with their makes and models in mind. After all, what looks great on a van does not necessary look all that hot on a pickup truck. Working with the vehicle’s design rather than against it has allowed our experts to come up with some eye-catching, striking creations that are sure to leave a memorable impression on those who see you. Since you are probably traveling not just to jobsites but also to gas stations, mini marts and in the inner city traffic, there is a good chance that a very large audience will see your graphics and learn about your company. When you are ready to take the Phoenix area by storm, we are ready to help you do it. You can request a quote right online!